He is risen! Easter is about the resurrection of Jesus Christ. The death and resurrection of Christ is central to the Christian faith. And as D.A. Carson said, “The entire Bible pivots on one weekend in Jerusalem about two thousand years ago.” Believers shouldn’t brush over the empty tomb—no, we can believe in the gospel because the resurrection happened, just as He said it would! The resurrection should change the way that we live on this side of eternity. Because of our union with Christ, we can live in light of the hope of the resurrection! It is this very hope that empowers us to live radical and countercultural lives. Are our decisions reflecting the hope that we have in the resurrection? Subscribe to Daily Grace: on iOS, go to our iTunes page and click subscribe. On Android, click this podcast RSS feed link and choose your podcast app. If needed, you can copy this link directly into your favorite podcast app (like Stitcher or Overcast). Or follow us on Spotify! We would love if you took a few minutes to leave us an iTunes review to help spread the word about Daily Grace! We want to invite more women into our conversations! Download The Daily Grace app: for iOS, click here to download. On Android, click here to download. Visit The Daily Grace Co. for beautiful products for the whole family that will equip you on your journey to knowing and loving God more. Subscribe to The Daily Grace Newsletter and receive free Bible study resources in your inbox. Like The Daily Grace Co. on Facebook. Follow on Instagram for the latest updates on the podcast and The Daily Grace Co. Engage with our Facebook community, “Lamp and Light”. Read The Daily Grace blog for encouragement throughout the week that is steeped in biblical truths. Thank you for supporting the products that support the production of this podcast! She unexpectedly lost a child in a tragic accident, unexpectedly lost her husband due to an unknown heart condition, yet those who know Maritza will describe her as joyful. Her story is a powerful testimony of our great God who makes beauty from ashes (Isa. 61:3). Maritza is a sweet sister in Christ and active member of Sojourn Community Church – Woodstock alongside Joanna. She is a widow and joyful mama of five adult children (plus one in heaven). She is a busy bee working as a defect and production manager at AT&T, a Chaplain for Marketplace Chaplains, and an employee at a yarn shop (where she also teaches others how to knit). May her story remind us that our God is completely sovereign and completely good. May her story encourage us by pointing to the unchanging nature of our God. We are grateful for her vulnerability and willingness to share her story, and in response, may we worship our God for who He is. Who are you? Does your life matter? Your identity informs everything you do, and the world, our flesh, and the Devil want us to misplace our identities. We anchor our identity in all the wrong places—what we do, what we love, what others have said about us, or even some hidden strength or identity within ourselves—but these things are not enough. We find out identity in Christ alone, and when we anchor our sense of self in who we are in Christ, every aspect of our lives will be transformed. Is the Bible true? We will get into the nitty gritty details and history behind the Bible. It's important to know why we value the Scriptures so highly, and we’ll talk at length about the beauty and glory of God seen in Scripture. We can stake our faith on our sacred text, the Bible. #preachingthegospeltomyself // what does that mean? How do we do it? Why is it an important practice in our lives? We are going to start with sharing what the gospel exactly is -- we need to know the gospel in order to be able to communicate the gospel to ourselves and others. Only then can we apply the gospel to every aspect of our lives! We even share a lot of practical tips on how to do this -- it doesn’t have to be a long, drawn-out practice! Whatever you’re experiencing right now - tragedy, grief, loneliness, infertility, toddler tantrums, or just sticky floors -- the gospel applies. Verse Cards from The Daily Grace Co.
Romans | The Gospel of Grace by The Daily Grace Co.
Romans | The Gospel of Grace (Men) by The Daily Graco Co. In Everything Journal by The Daily Grace Co.
Abide Journal by The Daily Grace Co.
What does it mean to be a Christian woman? On this episode of Daily Grace, we have the privilege of chatting with Abigail Dodds on what it means to be a gospel-centered woman. Abigail is a wife to Tom of 16 years, a stay-at-home mama to 5 kids, author of the newly released book (A)Typical Woman, a regular contributor at Desiring God, a seminary student, and an active participant in her women’s ministry at Bethlehem Baptist Church. She helps us differentiate what our culture defines as being a Christian woman and what God says in His Word about womanhood. She reminds us that the whole Bible equips us as Christian women, but there are passages in the Bible specifically for women and it’s for our good and God’s glory. We chat about a variety of topics, such as singleness, marriage, suffering, discipleship, submission, and the local church. We hope that this conversation will encourage you to embrace who God made you to be and help you “live out your calling as [a] free, authentic, indispensable member of Christ’s mission and work”. Abigail Dodds is the author of the book, (A)Typical Woman. Find your copy here. Read The Daily Grace blog for weekly encouragement steeped in biblical truths. Hospitality should characterize God’s people. On this episode of Daily Grace, we discuss how the Bible defines hospitality and what role it should play in the believer's life. Biblical hospitality is vastly different than what our culture promotes as hospitality, and we’ll compare and contrast the two. We’ll also talk in depth about how hospitality should be an integral part of our lives as believers. But if you’re anything like us, this may be an area that could use growth. Sometimes, it’s hard to know where to even start! No matter what season of life you’re in though, having a hospitable heart and extending hospitality to others are absolutely vital. And this is why it matters - hospitality is a tangible way to show the gospel to our neighbors. We have been welcomed, cared for, and loved by Christ, so we strive to welcome, care for, and love others. It is an expression of our reverence for God. If you’re struggling in this area and would like a fresh perspective on hospitality that’s rooted in the Word of God, this conversation is for you. We even offer a few practical tips on how to get started and share some go-to recipes to feed the masses! *Dice an onion and add it to your ground beef. You may have to adjust the water amount - if it seems runny at first, let it sit for 10 minutes then re-evaluate. It usually turns out great! *A small portion of the marinade goes a long way! One bottle will last you multiple meals! Let it marinade for a couple of hours for optimal taste. I also like to use chicken thighs with this particular marinade. *Freeze them in batches for easy access on multiple occasions - just make sure you form them into balls and freeze them on a cookie sheet before tossing them into ziploc bags! *My friend Alyssa also suggests trying these substitutes: use Kerrygold Pure Irish butter at room temperature and swap out milk chocolate for dark chocolate! *You can easily adapt this recipe to the Instant Pot - use the sauté function to sauté the veggies as directed then add the remaining ingredients and cook on high pressure for 12 minutes, then quick release. *If you don’t want to make homemade bread, buy a loaf from the store, wrap it up in aluminum foil, and warm it up in the oven! *This recipe is for a slow cooker, but you can easily adapt it for the Instant Pot. You can cook it at high pressure for 8 minutes, let it naturally release for 5 minutes, and then flip the release valve. You can also easily shred the chicken using a Kitchenaid or hand mixer! *The options for taco bars are endless - keep your topping selection simple if you don’t have the margin to get creative! The Bible is actually one story - from Genesis to Revelation, there is a unified narrative that all points to Jesus. This is easily seen through four plot movements: creation, fall, redemption, restoration/consummation. You may have heard this referred to as the “metanarrative” of Scripture. Understanding this will change the way you approach the Word of God and enrich your study. You’ll even be engaging in biblical theology, which is a type of theology that focuses on how the revelation of Christ unfolds in time. And we’ll also talk about how knowing this grand narrative impacts our own stories. This unified narrative can help us in our trials - if we’re going through hardship, we can reflect back on the Fall and how God promised a Redeemer, and He came! And He promises to come back again and make all things new. What a gift it is that we are a part of His story. May our hearts be in awe of our great God and His story of redemption. Amen: from Eden to Eternity by The Daily Grace Co.
Bible Gel Highlighters by The Daily Grace Co.
We all experience busy seasons, and today we are chatting about what Bible study looks like in the midst of the craziness of life. We’ll talk about why we need God’s Word when our plates are full, and share some practical ways to prioritize Bible study. Come join us! Scripture Memory Journal by The Daily Grace Co.
*This reference was mentioned in the episode as 1 Timothy 3:16-17; however, this verse is actually 2 Timothy 3:16-17. We apologize for that mistake! We're chatting with Kristin Schmucker on one of our favorite topics - biblical literacy. Kristin is a wife, mama to four, seminary student, Bible study author, and co-founder and CEO of The Daily Grace Co. She is passionate about equipping women to study God’s Word and grow in their knowledge and love for Him. Kristin shares how The Daily Grace Co. came into existence, and how God’s Word comforted her in a season of loss and grief. She breaks down what biblical literacy means and shares encouraging words for anyone new on this journey of growing in biblical literacy. She also talks about the beauty of the local church and how it can enrich our personal growth in biblical literacy. If you hear anything in this conversation that you have questions about, please feel to e-mail us at podcast (at) thedaliygraceco (dot) com. Also, download the new The Daily Grace Co. app on iOS or Android devices to get a FREE study called “Word of Life” that will help you study the Bible and explain why it matters. Tell us the story of how the Daily Grace Company came into existence. What is Biblical literacy? Why is it important (for women specifically)? What has Bible study looked like in your life over the years? Why is growing in Biblical literacy important to you? How has your view of God, His Word, and self changed since you began studying His Word every day? Can you share how your study of God’s Word prior to tragedy helped you in the midst of loss and grief? Where would you encourage someone completely new to the Bible start on their journey of pursuing Biblical literacy? How can a normal, stay-at-home mama (or even a high school or college student) grow in Biblical literacy? What encouragement would you give to a woman struggling to find the motivation to read God’s Word or to a woman who thinks daily Bible study is for “super Christians” or women in ministry? How can we grow in Biblical literacy with others in community? What’s one resource (book, person, experience) that has most stirred your affection for God’s Word? Everyone’s a theologian. What exactly does that mean? What is theology? It’s not as scary as it sounds! We’ll talk about what the goal of theology is, and why theology even matters. We’ll share our personal stories regarding our study of theology and the impact that it has had on our lives. We’ll start off by defining theology. It’s not as scary as it sounds! We’ll talk about what the goal of theology is, and why theology even matters. We’ll share our personal stories regarding our study of theology and the impact that it has had on our lives. We dive a little deeper into the acronym S.C.A.N., which details the four traditional attributes of Scripture, because the Bible is the primary place we should look for our theology. Then we’ll move into a more practical discussion about how you can engage in theology, even if you’re a new believer! We’ll top off our conversation by talking about the potential pitfalls to watch out for as you grow in your study of theology. If you hear anything in this conversation that you have questions about, please feel to e-mail us at podcast (at) thedaliygraceco (dot) com. “Amen” study from the Daily Grace Co.
Daily Grace exists to encourage and equip women to seek God in His Word. Our goal is for women to know that deep Bible study, sound doctrine, and rich theology are not just for the seminary student or pastor, but are accessible and transformational for all believers. We want to invite women to join us in our conversation about our great God, and be encouraged to seek a deeper knowledge of God that leads them to live their lives for God’s glory as they grow in love and awe in response to who He is. 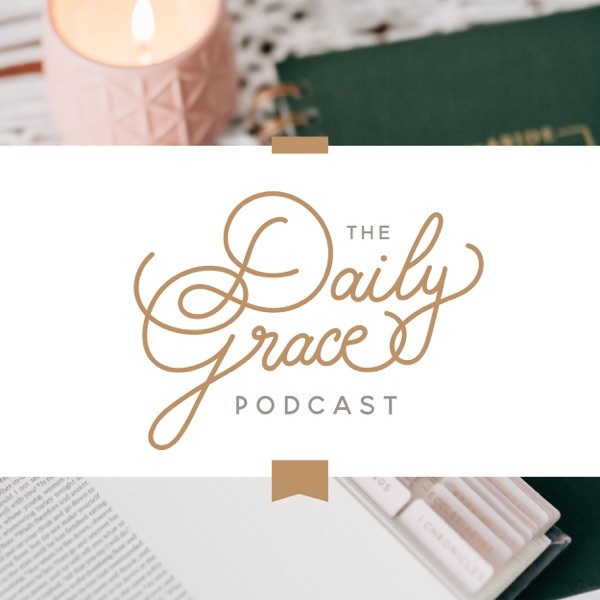 Daily Grace is a weekly podcast brought to you by The Daily Grace Co. and hosted by Joanna Kimbrel and Stefanie Boyles.